Just a few weeks ago on this site, I reviewed Guy Maddin’s ludic film-history pastiche The Green Fog. In it, I referenced one of the movie’s more rigorous forbears: Histoire(s) du Cinema, Jean-Luc Godard’s eight-part philosophical treatise, completed over a 10-year period and collaged entirely from upcycled images. This must be a boomtime for film essays composed of repurposed clips, because a little over a fortnight later, at least one brave theater in the Palm Beaches has programmed Godard’s latest, The Image Book, which picks up where Histoire(s) left off. Propelled by sometimes-cryptic intertitles and Godard’s own voice-over narration, The Image Book is, like its predecessor, a broken double helix of audio and video, and a mixed-media dance between the obscurantist and the confrontational. Some of the clips, intimately personal to Godard, will be immediately recognizable to cineastes: You’ll notice lingering gazes toward Un Chien Andalou, Johnny Guitar, Young Mr. Lincoln, Shanghai Express, Salo, previous Godard films — from Les Caribiniers to Notre Musique — and hypnotic doses of Hitchcock, including Vertigo, Notorious and The Wrong Man. Other titles flit by more conspicuously, according to the credits: Le Silence de la Mar, Los Olvidados, even, apparently, newer titles like Timbuktu, Syriana and About Elly. But feature films are only one of The Image Book’s many reference points; there are also images of historical atrocities, unidentified streets in the modern Arab world, contemporary protests and uprisings, Middle Eastern terrorist activity, and snatches of symphony, opera, literature and visual art. To what does it all add up? The Image Book arguably recapitulates the self-reflections, brooding obsessions and moral hazards of Godard’s twilight era, namely the cinema’s inability to properly reckon with, and represent, the violence that shook the world over the 20th and, now, 21st centuries. In the chapter titled “St. Petersburg Evenings,” images of decadence — characters waltzing around a ballroom in a Soviet period piece — contrast with documentary video of war and slaughter, our recurring human condition. It’s an old saw: We amuse ourselves to death while the world crumbles, fiddling while Rome burns. But in his sly way — he may be humorless these days, but he’s not witless — Godard underlines the ways movies have enabled this disconnect, if not outright supported militarism and Western hegemony. In the film’s most lucid edit, a shot of the nose of a warplane bearing painted-on “teeth” cuts to a shot of Jaws emerging from the ocean, mouth open, one manufactured killing machine influencing another and vice versa. Godard’s own words, spoken in a low-register voice-over, elucidate some of these themes; he speaks of “moral fault merg[ing] with state crimes.” In other places, he speaks in provocative counterpoints and epigrams that beggar further extrapolation: “Even under Communists, money is most important” and “terrorism is one of the fine arts.” Still other bromides have the dispassionate lucidity of a Chris Hedges or Noam Chomsky missive: “The richest ravage the global environment by producing waste, while the poorest destroy their resources by lack of choice,” and “Do you think men in power today, in this world, are anything other than bloody morons?” Godard may be a crank, but he’s not wrong. 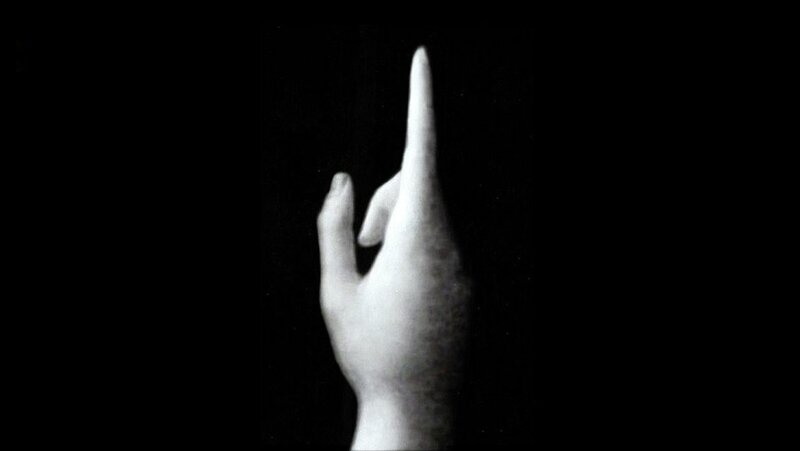 In fact, The Image Book may one of the most accessible films Godard has made in the past two decades. Except, that is, for its final 20 minutes or so, beginning with a head-scratching chapter titled “Joyful Arabia.” Godard narrates the decline of an invented sheik in an invented Arab emirate known as Dofa, who suffers the vagaries of the geopolitical oil market. This wends toward the conclusion that bomb-throwing is normal in the Middle East, and is a reaction to the rotten militarism of the West, a not uncommon leftist position that, in its presentation here, comes across as willfully esoteric. But putting politics aside, if that’s even possible with Godard, The Image Book feels like an elegy for film itself — not movies but film, as in celluloid, the disappearing format that sustained an industry for more than a century. Godard doesn’t just repurpose clips as they were shot and presented; he warps them, slows them down, washes them out, bleeds their colors, turning immaculate studio-film compositions into pixelated, psychotropic abstractions. Perhaps this is one reason the movie’s Wikipedia page labels it, so matter-of-factly, as an “avant-garde horror essay film.” Indeed, there’s plenty of subtle horror in The Image Book, an experiment about, among other things, the degradation of film to time, neglect and technology. It’s a melancholy coda to an intellectually robust movie — one that I screened, inevitably, through a digital streaming service.